I have recently decided to get into the jewelry business. Well, that's not exactly how it went... Several women and teenage girls in Buwundo village were meeting weekly to study the Bible with me. During our prayer request times, some of these women would share about someone who was sick but didn't have the money for medical treatment. Many others were requesting prayer for a way to provide school fees for their children, grandchildren or themselves. Most of these women work in their gardens, but they grow just enough food to feed their families and sometimes a little more to sell and then buy soap or medicine when they are sick. As we gathered to pray, I would ask God to meet their needs. I did not want Bible study to become the place for handouts, but I also would pray for wisdom about how these needs might be met. In order to support these women, I have often bought chickens, woven mats, and other things they have been able to make. Recently, I found a few women in the village who knew how to make beads out of scrap paper. They also have learned how to take those beads and make some beautiful necklaces. Since there were others who also wanted a way to earn money for school fees, I bought the supplies and offered that others in my Bible study could make these necklaces too. Since it was a break between school terms for the Ugandan school system, many families were looking for a way to earn money for the next school term. I began expanding this project to include others, but soon found that I was regularly having people show up at my house asking for supplies or asking to sell their necklaces. Remember that I am a teacher, a wife and a mother of four. People were coming before school as we were getting breakfast or waiting at my house when I got home from school to ask for more supplies or to sell necklaces to me. I quickly realized that this was not going to be a good idea long term. During my day away to pray last week, one of the things I prayed about was how to proceed. I didn't want to shut down the project, but neither did I want to spend every spare moment managing a business on the side. As I prayed the idea came to mind of selecting one of these women as a business manager. She could manage the supplies, and I could purchase the finished necklaces once a week on the day of our Bible study. As I prayed about it and then discussed this idea with David, he was supportive of not having our home become a trading center. He also suggested having the women buy the supplies in order for them to have some ownership and use them wisely. After organizing all of my thoughts, I called for a business meeting. I thought the ten or so people who were already coming to my Bible studies and who were currently making necklaces would come, but it was more than double that. I had a friend come to translate whenever my Luganda was not sufficient in order to make sure everything was very clear. He also served as a secretary to help keep our records straight. I was concerned that the women would not be happy that now they were going to have to purchase supplies when I had provided them for free at first. But when I explained that I was selling them the supplies at a fraction of what I am paying, they broke out in applause. When I explained that we need to pray that we can find a way to sell these necklaces for them in order to continue this project, they prayed. When I explained that they would be only be able to sell to me once a week, they all understood. I was very encouraged about the desire of the women to study the Bible, worship and pray together, which we do each week, but also about their desire to work and save half of what they earn toward school fees for their children. Today was my first day to buy necklaces from the larger group and the weekend before the start of another school term. 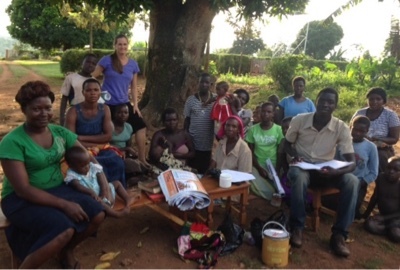 The women and teenagers have been working hard in order to sell enough to pay for their next term of school. It was exciting to celebrate with them as they brought many beautiful necklaces, some earrings and a few bracelets to sell. 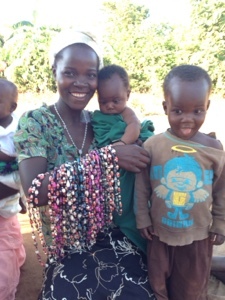 Young children even tried to make some necklaces as they were hoping to earn money to buy snacks or school supplies. As you can see from the photo, I now have many necklaces! Some of the women are starting to make earrings and bracelets too. 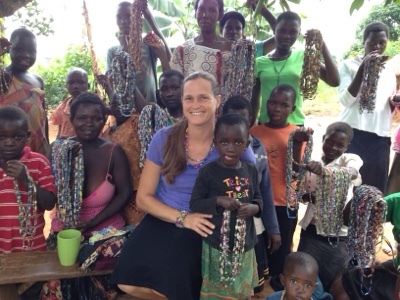 While I was wondering and praying about what I would do with all the jewelry that I would buy, a friend connected me with a woman in Jinja who wants to help sell things to support local ministries. I doubt that we will be able sell all of the things I buy at that one store, so I am also sending some of these back to America for some friends to help either sell or distribute for me there. If anyone wants some handmade jewelry and wants to contribute to the needs of my neighbors in Buwundo village, Uganda, let me know! This is such a neat ministry! We just bought our first of hopefully many bulk orders today. These jewelry pieces are so special and so beautiful. These women really have a gift and I pray that God Blesses your ministry. I really believe these will sell so fast in the Americas! I hope you find that you cannot keep them in stock over here because they sell out so fast and have to send us more. Thank you so much for bringing the gift of their artwork here! I work in the fashion industry and I cannot wait to share these treasures with my clientele and friends. There is no better way to market then to wear it yourself, which I will be doing so proudly!